This one is not for the faint-hearted. 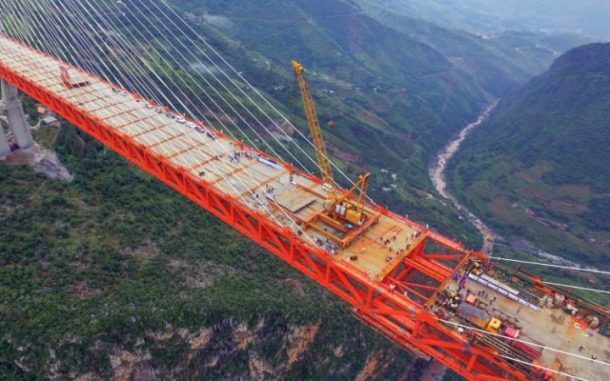 Gloating at 496 m (1,627 ft) height, the Sidu River Bridge in Hubei Province, China has been officially the world’s highest bridge since 2009. 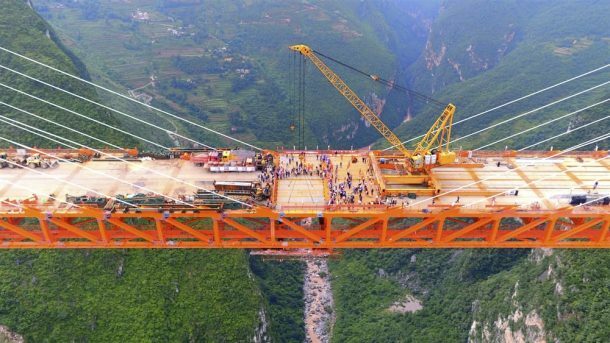 But its reign at the summit is about to be thwarted, as the Beipanjiang Bridge Duge over the Nizhu River Canyon in Guizhou province, China is now about to be opened for traffic at the height of 565 m (1,854 ft). To be clear, there is a difference between highest and tallest. A bridge’s height is the measure of maximum vertical distance between the ground and the bridge deck, not the height of the structure itself. The tallest bridge is still the Millau Viaduct in France, at 343 m (1,125 ft), but this one is no way any less impressive. 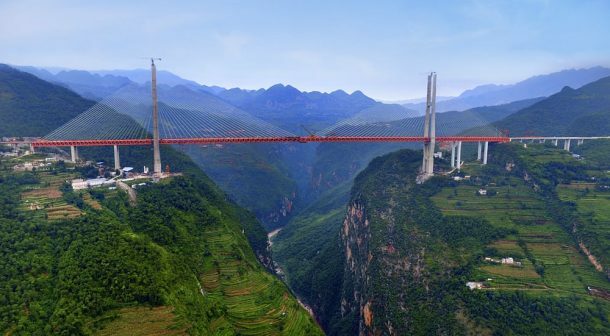 The Beipanjiang Bridge Duge has been built in a tough landscape which has hosted several high bridges across its terrain. 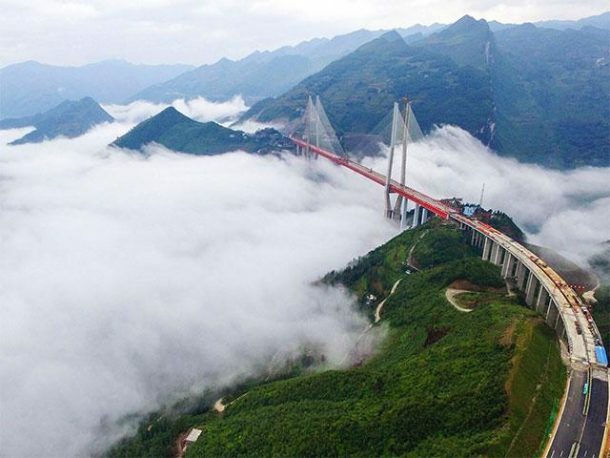 Along with this bridge, the Guanxing Highway Bridge, which was the highest bridge between 2003 and 2005, and the Shuibai Railway Bridge, which still is the world’s highest railway bridge are also located in the area. 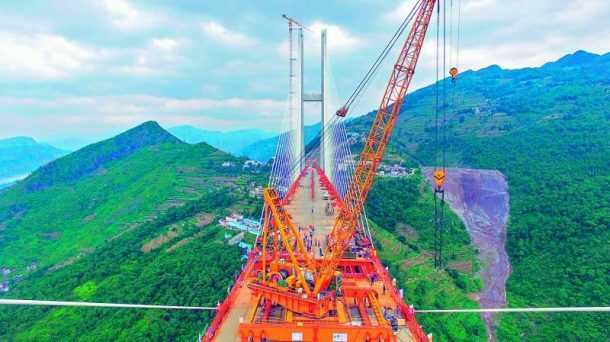 Although the bridge is making headlines for its height, it is equally impressive when it comes to length, spanning 1,341 m (4,400 ft) across in total. The extreme landscape of the area forced the travellers to take fairly indirect routes between cities. But the construction of this mega project will help cut the travel time between Liupanshui, Guizhou to Xuanwei, Yunnan, from five hours down to less than two. Would love a bungee jump over this beauty if there ever is a chance of doing that. Have anything else to add to the above information? Let us know in the comments’ section below!